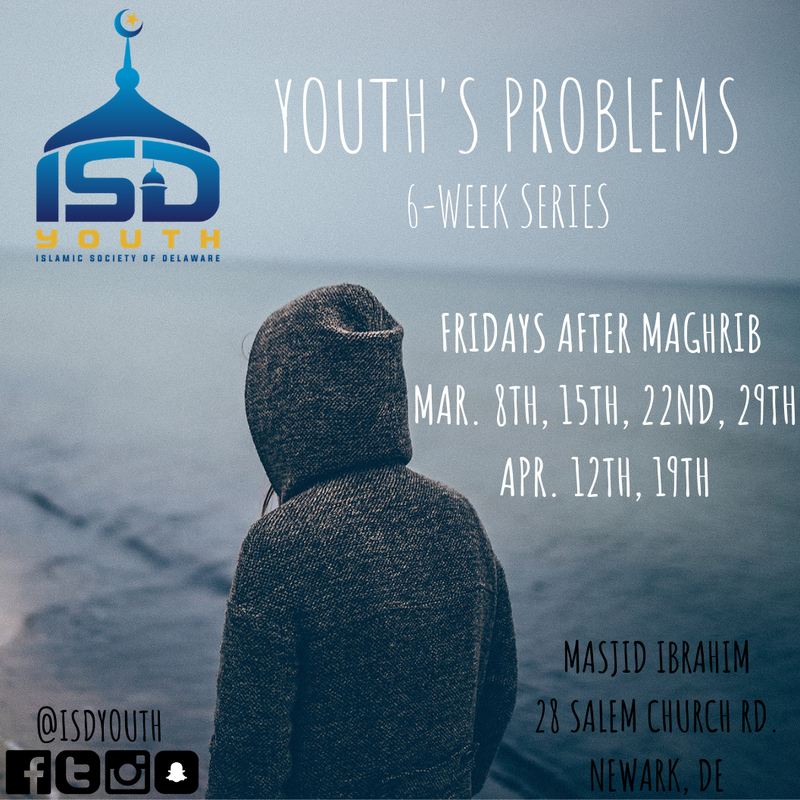 Tomorrow will be the second program in the six-week series about Youth Problems. The sub-topic for tomorrow will be "Peer Pressure." Adrian Coverdale will be the guest speaker and he will be providing practical tips youth can apply in order to deal with issues surrounding peer pressure. Br. Adrian is a soccer player at Wilmington University with a major in criminal justice. 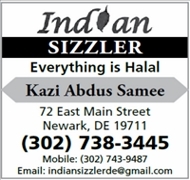 He will also briefly talk about his journey to Islam and how it helped him escape the fitna around him. 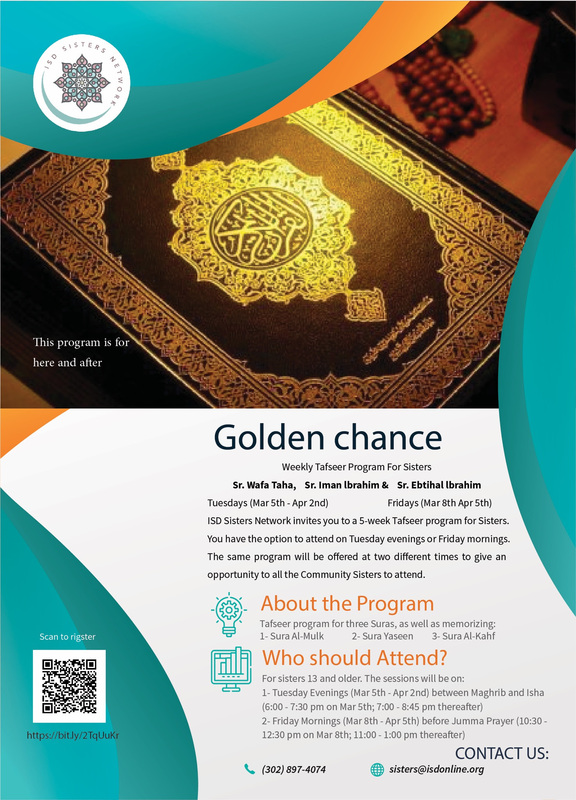 ISD Sisters Network invites you to a 5-week Tafseer program for Sisters. You have the option to attend on Tuesday evenings or Friday mornings. The same program will be offered at two different times to give an opportunity to all the Community Sisters to attend. Thereafter, the time will adjust by an hour for daylight savings. Br. Soufiane will be discussing lessons from the Quran with the youth. This is open for the youth, ages 13 and up. This program will follow the Sunday School schedule and continue until the end of the Sunday School year. The first Quran Cirlce will take place this Sunday, March 10th. 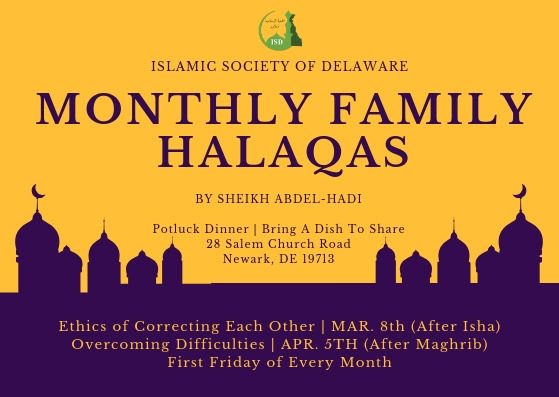 The next community family halaqa has been postponed and is after isha prayer on Friday, March 8th, 2019. The topic will be: "The Ethics of Correcting Each Other" by Sheikh Abdel-Hadi.